Boone Central seniors line up to receive their diplomas on May 15. 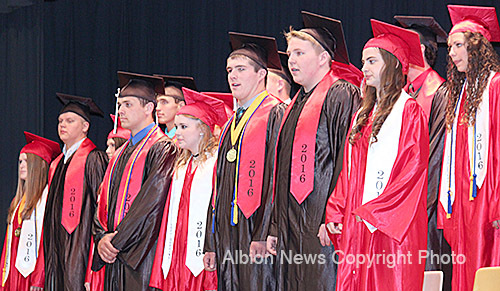 Class speakers saw a positive future and a new chapter of achievement for the 49 Boone Central High School graduates honored at commencement exercises Sunday, May 15. “Big changes are coming, and we are ready for the next step,” said class speaker Isaac Sullivan. He looked back on memories and class achievements from each year of high school. “Our class is amazing, and I want everyone to remember that,” he said. Details and photos in the May 18 Albion News & Petersburg Press Print and E-Editions.